With Halloween just around the corner, we are getting very excited about the day here at URBAN eat. We have been hastily buying our Pumpkins and carving tools ready to beat the rush for any last minute shortages that may occur. 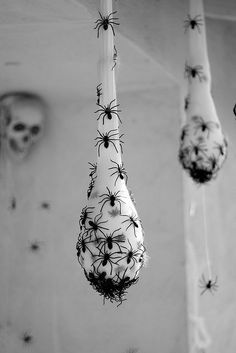 We have decided to compile our 5 scariest homemade Halloween decorations for the ultimate fright night at your haunted house. When you are ready to set the scene, activate your glow in the dark sticks and sticky tape them to the inside of your tube. Place in the ultimate hidey places around the front/back of your house and giggle as you scare people into the approach to your house. Spiders will no doubt make the bravest of your friends cringe when the think of 8 bent legs slowly crawling up their neck… (Shudders!) So we have the ultimate spine tingle with these beautiful creations. What you need: 9 pairs of white opaque tights, 3 large oranges, five bundles of spiders, superglue, a needle and some string. Dangle a spider from the nest using string that you have threaded through the nest itself to attach it. Incredibly simple to make your home look a little more gothic and creepy in comparison to your usual lighting arrangements. What you need: 10 or more old metal ladles with a hook on the end – please note, plastic may melt. Tealights, black paint, sandpaper and something to light your candles with. Hang them around the house accordingly with a tealight in each one. You can use electric tealights one too which will not need supervision when lit. Whilst having family photos around the house are lovely, they can ruin any spooky mood you do try to create. So we have found this ingenious way to replace your loved ones whilst still displaying them – it does may for a little bit of fun too! What you need: 4 or 5 large jars, paper, scissors, a printer, sealable food storage bag, vinegar or brown liquids such as apple juice, family members, a camera and a window. Gather the family together and get each member to push their face up on the glass of a window, whilst taking a picture from the other side. Ensure each member pulls a truly unique face to boast at the same time too. Once this is done, print the photos to about an A5 size and cut out – placing each one in its own food bag and make sure the image is sealed tight. Place one inside each glass jar you have, and push the image up against the glass to make the face look squashed in. Seal the jar up and position around the house instead of your nice family photos and be prepared to shock guests with these creative photos – it’s the little things right? 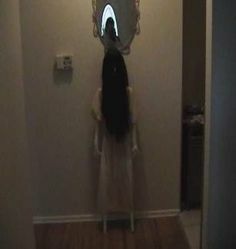 If you want to ultimately scare your guests be sure to recreate the girl that creeps the end of the hallway in the dark with no face – or any other features… as it just watches guests pass it. Hang your large hanger from your small hanger and tape it so it’s central. Tape your nose to the bottom of the small hanger so it’s fairly central in the scheme of things. Place your other hook on the wall and hang your girl – be sure to keep the lights dim in this corridor so she just about stands out and terrifies any unsuspecting passer-by! We hope you enjoyed our scary homemade Halloween decorations and if you try any, we would love to see your creations through our Facebook or Twitter pages!